What to know what new audiobooks have arrived? Here at the SFFaudio Research and Development Lab, we’ve been watching TV hard at work on innovative solutions to match you with your audiobooks. That’s why, when we noticed that Scalzi started to use Twitter to list his incoming books, we immediately spent hours reading his list leapt into action. We stole his idea, called it our own, and started our own feed called NewAudiobookIn. Turns out that is a very quick and easy way to note everything that comes in. Our regular Twitter feed, @SFFaudio, will not be changed. Stay tuned for other copied innovations, like the new SFFaudio Grill. We’ve also been playing with a new thing all the kids are doing called YouTube. Coming soon! Lots of Hugo Award talk, as this year’s nominating deadline rapidly approaches (Feb 28 is the final day to submit nominations). 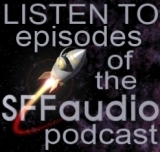 We’ve got a page here at SFFaudio that contains a list of audio versions of Hugo Award winning fiction. We compiled it over four years ago. Things have changed so rapidly over the last two years that the page fell embarrassingly out of date, so Jesse and I are rebuilding it using nothing but twine and an old screwdriver. Oh yeah, and the internet. We’re including cover art when we can find it, so the process is slow – but here is the first part which contains a list of Hugo Awards from the 2000’s. Find it |HERE|. If you spot any errors or omissions, please contact the nearest authorities, and then zip me an e-mail. Our hopes and dreams include getting a new decade added to this list each week. For those of you who use Twitter, we’ve got two Twitter feeds here at SFFaudio. The first is an automatic feed that provides a link to each post we do. Find that one here: http://twitter.com/sffaudio. The second is my personal Twitter feed, which I promise to keep audio and book related, at least until the zombie uprising. Find that one here: http://twitter.com/sdanielson. Over the holiday, I started a new column at The Fix Online. It’s called “Rocket Science”, where I’ll be reading and reviewing Hugo Award winners in the various short fiction categories. I started a similar thing on a short-lived blog I had called SFFreader. This one’s a bit more structured – I’ve got deadlines, and I’m going through them in a logical order. I sure enjoy doing it! The first column covers 1955 – 1956 and was posted on January 1. “The Darfstellar” by Walter M. Miller, Jr. I know of no audio version of “The Darfstellar“. “Allamagoosa” can be found on audio in humbly titled anthology The Greatest Science Fiction of the 20th Century, which is available from Audible.com. An audio version of “Exploration Team” was produced by Dercum Audio in 1986. “The Star” was recorded by Arthur C. Clarke for Caedmon (my preferred version), and can also be found in Fantastic Audio’s Collected Stories of Arthur C. Clarke series of audiobooks. Time to update our Hugo winners on audio page! Lots of titles have been produced since we put that page together. My Audiobook Fix column will continue, but will not be a regular feature. If I’ve got some short fiction audio to talk about, I’ll write it up and get it to them, but the column won’t appear monthly.